Yes, the rumors are true... I hit my seventh month mark!!!! Got me some DÖNER to celebrate. Feels like just yesterday and yet at the same time like foreverrrr ago when I got here. I can hardly say how much the time and experience has meant to me. I am so grateful to be serving the Lord in this blessed and lovely country. I love Germany. Need I say more? Ok let's get to the good stuff. Most challenging thing of the week... the weird weather. Tuesday we tried going by on some referrals from a member on the street, but they were not interested. So we went by on this lady who was a contact in the area book (description: gypsy family- lolololol) I had tried her once or twice before, but she was never home. What do you think I am going to say next? Yes, yes she was home. Although the apartment building was pretty shady, their living room looked like a mini mansion. haha, strangely amusing. So we talked about the Book of Mormon, and she told us of her experiences with churches she has already ruled out as 'false'. She was really chill and hat sich total gefreut to get the BofM. We are going back tomorrow. It was awesome!!! Talk about being in the right place at the right time. Wednesday we had a really cool district meeting. I MADE CINNAMON ROLLS. Yes from the recipe you sent me mom, A TOTAL SUCCESS. oh meine güte they were SOOOO gooooood. I will send a pic. Something we are doing now in our zone during DMs, are doing the lessons in 7, 5, 3, then 1 minute. So Elder Mace, district leader from England, rolled a dice to choose the first person, then that person chose the next person, and so on . haha nobody wanted to choose the sisters!!! Fine by me, but I do like giving the one minute lessons, those are hard!! Then later that day we had our tausch with our STLs, I went to Altona (hamburg) with Sister Clegg. Came back Thurs afternoon. It was really solid, Sister Clegg is awesome. Really easy to talk to and make conversation with. Thurs we went to a recent convert of about a year for a visit with the elders. the elders usually go, but the member invited us this time as well. HIGHTLIGHT OF THE WEEK. Coming at you. We walk in, AND I FELT LIKE I HAD WALKED INTO SOME GERMAN VERSION OF THE PHANTOM OF THE OPERA'S LAIR. No lie. deutsche dunkelheit, candles, wack\really cool chandelier, almost minor classical music lulling in the background. He had literally built all this stuff into the walls, it was wild. I was dying. It was so fun, He had a full spread of goodies for us as we talked. It was awesome. He is so cool, calls himself "crazy" (yes in english). Oh man that was definitely the highlight of the week. Saturday morning right after we finished our studies, Chris from the ward called, and told us if we had no specific plans they needed help with a family moving. WHOLEHEARTEDLY ACCEPTED. Man oh man so we rolled over there in the bus IN PANTS. That was fun. sooooo sore after though! haha, our gml, Bruder Nowak, kept telling us how he couldn't recognize us in our jeans. Good times, good times. It felt awesome to help this family out, and serve there with some other ward members. SO you have seen the “Because He Lives” video!! I love it. We have like a million little cards to give out, and invite people to learn more about the life and characteristics of our Savior Jesus Christ. I am so excited this week is Easter. The video is of course supposed to go on until Christmas, but especially with Easter this week, it is great to reflect on Jesus. I love the scripture in 2 Cor 12:10. Seriously, this scripture is golden. Christ went through everything for us. Everything! The song "I Stand All Amazed" comes to mind as well. I cannot even comprehend how much Jesus loves us, it is truly a miracle. He took on the world, and that makes it possible for me to take on everything that I am faced with. I can do everything through Him. I love Him. SO STOKED FOR CONFERENCE. We will watch the morning sessions live. Women’s Conference on Saturday afternoon. Saturday afternoon on Sunday afternoon. Then Sunday afternoon the next Sunday (oh the suspense!!!) I really appreciate conference more as a missionary. My testimony of the prophet has really been strengthened as I have taught about the restoration of the Priesthood and Gospel. I will be in Heaven. and with transfer calls Saturday morning it will just be craaaaazy fun!! 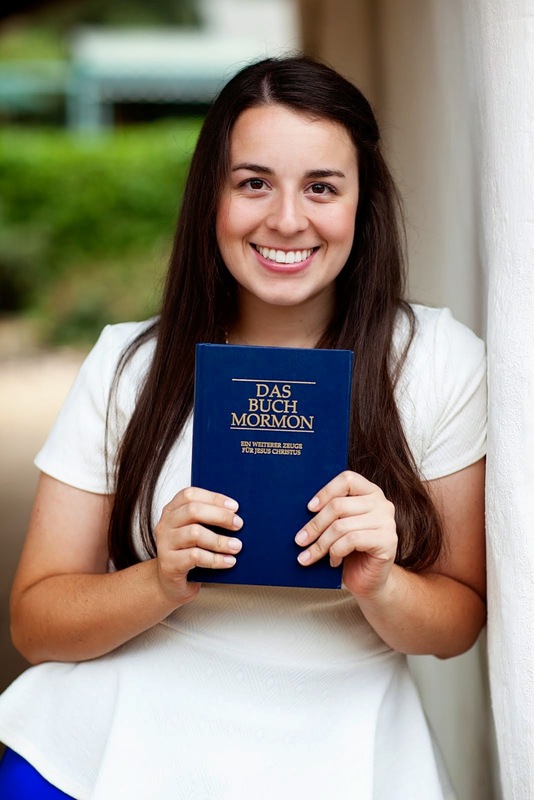 I really hope you know how much I love this church, and this opportunity to serve a mission in Germany.